Newport Beach, CA – The Pacific Club IMPACT Foundation has named 42 student-athletes to the 2017 Lott IMPACT Trophy Watch List. The list of the top defensive players in the country includes 17 linebackers, 14 defensive linemen and 11 defensive backs. The Pac-12 Conference has the most players on the Watch List with ten (10) followed by the ACC with nine (9), the Big Ten with eight (8), the SEC with six (6), the Big 12 with five (5), the AAC with two (2) and two (2) independents (Notre Dame and Navy). Penn State, Ohio State, USC and Virginia each have two (2) nominees. To date, the Lott IMPACT Trophy has donated more than $1.3 million for various charities throughout the country, including more than $500,000 to universities. The winner of the 14th annual Lott IMPACT Trophy will be announced at a banquet Dec. 10 at the Pacific Club in Newport Beach, Ca. 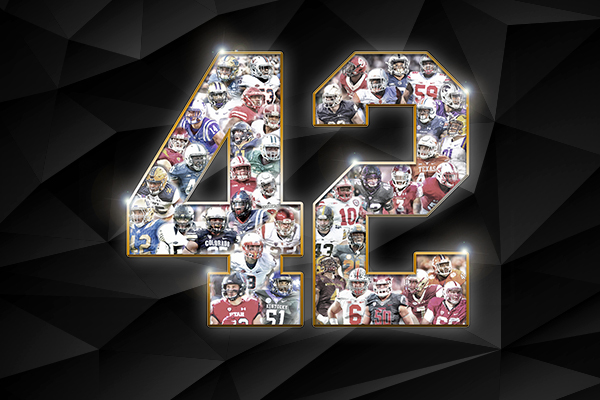 Named after Pro Football Hall of Fame member, Ronnie Lott, The Lott IMPACT Trophy is awarded to college football’s Defensive IMPACT Player of the Year. Founded in 2004 by The Pacific Club IMPACT Foundation, The Lott Trophy is the first and only college football award to equally recognize athletic performance and the personal character attributes of the player. The Lott Trophy is given to the player who exhibits the same characteristics Lott embodied during his distinguished career: Integrity, Maturity, Performance, Academics, Community and Tenacity.